CAVO Newsletter, November 2014. Issue: 01 News and updates on open-source voting. The November 4th midterm election date has come and gone but election officials are still hard at work processing provisional ballots, auditing vote tallies and completing all other responsibilities required to certify election results. This election cycle we saw the consequences of fatigued voting systems and budget cuts across the country. There were reports of machine calibration errors, voters receiving the wrong ballots, rosters not arriving at precincts timely, voting machines programmed incorrectly, balloting materials going out late and slow election results reporting. Many of these issues were blamed on technical problems and staff shortages, both of which, open source technology can help to alleviate. This past decade we have seen an incredible expansion of technological advancements in the private sector. However, politics, funding shortages and bureaucracy have stood in the way of government benefiting from these same innovations. Conducting elections is largely still a human-centric event based on systems, time lines and discipline. In order for elections to take place, election officials must rely on people to carry out all of their assigned tasks with 100% accuracy. However, to err is human and everybody makes mistakes. Technology can be useful in election administration by streamlining task flow, increasing transparency and providing consistency in equal application of the law. So what is holding back the introduction of innovative technology for voting? Sadly it often comes down to dollars and cents and this is where the development of open source software comes in. Open source software run on commodity-off-the-shelf (COTS) hardware is the lowest cost, most reliable alternative to current voting systems. Reducing hardware costs from $5,000 single use machines to $500 commercially available computers is just one example. As equipment and software costs go down, capital is freed up to allocate to others areas of election administration. The California Association of Voting Official’s (CAVO) mission is to develop and make available open source voting systems for use in public elections, as well as to provide training, education and management practices to election officials for the effective employment of technologies. As you will read in this newsletter, there are many areas of election administration that can be improved upon with technology including getting information to voters via accessible websites, using GIS to ensure that voters receive the correct ballots and the development of open source elections systems to count votes. Well into the 21st century, our technology advances should provide us the opportunity to ensure that everyone’s vote is counted accurately and securely without being held hostage to private vendors nor aging, outdated infrastructure. Innovation through open source development will provide us the capacity and certainty to administer elections for this century and keep the promise of our democracy namely that your vote will always, if cast, count. There are many ways to distribute software. Valuable software nowadays is usually distributed under a free and open source license (FOSS license, in short), both because it is usually "free of cost" software but also "free of restrictions" on copying, making changes, and redistributing that software. FOSS licenses offer several distinct ways to give software away. Choosing among those licenses for software is not an arbitrary game of darts. For open source election software that can be trusted and always free, the choice of license is particularly important. That is why I recommend the General Public License version 3.0 (GPLv3) as the best license to use. This article gives several important reasons why. · Among the many FOSS licenses, GPLv3 is the most modern, widely accepted, and best understood license available today. Its predecessor license, GPLv2, is historically far and away the most used worldwide; GPLv3 is replacing it in the rate of license adoption for new FOSS software. · GPLv3 is a reciprocal license. Once a project or distributor releases election software under the GPLv3, it will remain FOSS software in perpetuity under the GPLv3 license. Modifications to that FOSS software will also be distributed in perpetuity under the GPLv3. This guarantees that our election software won't ever be taken under commercial covers and turned into proprietary software with unacceptable lock-in and source code restrictions that make voting untrustworthy. · The GPLv3 license promotes open and shared development efforts. While it is possible to create excellent open source software under more permissive FOSS licenses, those licenses allow commercial fragmentation of the software. That isn't appropriate for widely used election software. · The GPLv3 encourages trustworthy software. There is a law of software development named in honor of Linus Torvalds stating that "given enough eyeballs, all bugs are shallow"; or more formally: "Given a large enough beta-tester and co-developer base, almost every problem will be characterized quickly and the fix will be obvious to someone." GPLv3 software projects invite eyeballs on all distributed versions of the software to identify bugs and security issues; other licenses don't always do that. · Although GPLv3 will specifically encourage FOSS development practices for the election code base and its derivative works, that GPLv3 license is nevertheless compatible with successful commercial software and support business as well. One need only refer to the robust Linux ecosystem and its contribution to diverse commercial technology worldwide, whose basic software is entirely under the GPLv2 and GPLv3 licenses. The GPL licenses made that possible. · GPLv3 will encourage innovation because GPLv3 source code is open to view and change. For these reasons, CAVO recommends that election software be distributed under GPLv3. This will inevitably create a diverse, worldwide, and enthusiastic community of software developers to create election systems we can all trust. The OSET Foundation claim on their website that their license is "an open source software license" is simply untrue. They can try to make it so by submitting their license to www.opensource.org and following OSI's published license review process. While I am merely an observer nowadays of that license review and approval process, as former general counsel for OSI I am confident that certain provisions in that license make it incompatible with the GPLv3 despite the assertion on OSET's own website that it is. *Lawrence Rosen is a CAVO board member, an attorney and a computer specialist. He is founding partner of Rosenlaw & Einschlag, a law firm that specializes in intellectual property protection, licensing and business transactions for software technology. Larry served for many years as general counsel of the non-profit Open Source Initiative (OSI). He currently advises many open source companies and non-profit open source projects. Larry's book, "Open Source Licensing: Software Freedom and Intellectual Property Law", was published by Prentice Hall in 2004. He also taught Open Source Law at Stanford Law School. Larry often publishes and speaks around the world on open source and intellectual property issues. 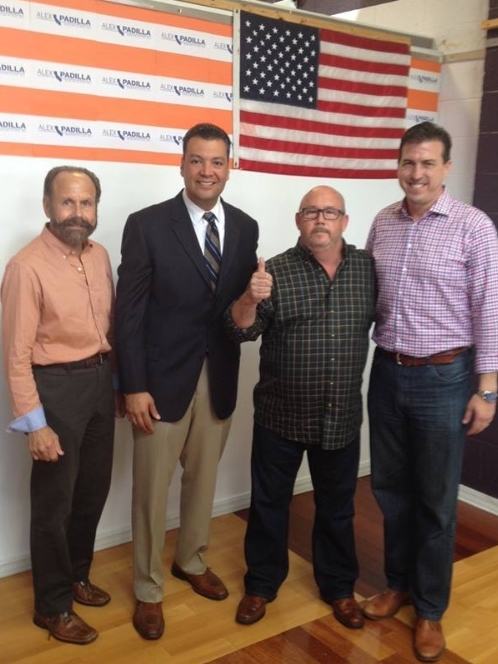 California rallies for best election practices: Outgoing Senator Padilla (second left) together with Sen. Jerry Hill, CAVO Secretary Brent Turner and Assembly Member Kevin Mullin. "Open source is the ultimate for election system security," State Senator Alex Padilla, who was elected as California's top elections officials on Nov. 4, recently said. Speaking at a rally for his bid for California Secretary of State on Oct. 25, the outgoing senator said he intends to follow upon his legislative efforts to upgrade CA's voting systems. The open source community has been pushing CA to move toward open source voting technology for over a decade. The passage of Senator Padilla's SB 360 bill has been celebrated as a positive step toward General Public License (GPL) open source systems. Los Angeles County has approved a $15-million "sole source" contract for designing a new voting system with touch-screen machines, according to a report published by the Los Angeles Times on Oct. 21. By approving the contract, the Board of Supervisors have taken a major step that will overhaul the current ink-based ballot system, which experts note is antiquated. LA County Officials say the new system will be easier to navigate and minimize the risk of errors in casting and counting votes. The Board of Supervisors have approved the contract with Ideo, a Palo Alto-based consultant, to design the new system, in which, not a vendor but the county will own the computer code that operates the voting machines. Community activists have voiced concerns regarding the "no bid " aspect of the contract and its 15 million dollar price tag. An Inyo resident casts her vote to test the Live Ballot Tablet system. Inyo County residents found the chance to participate in the testing of a new voting system on November 3. 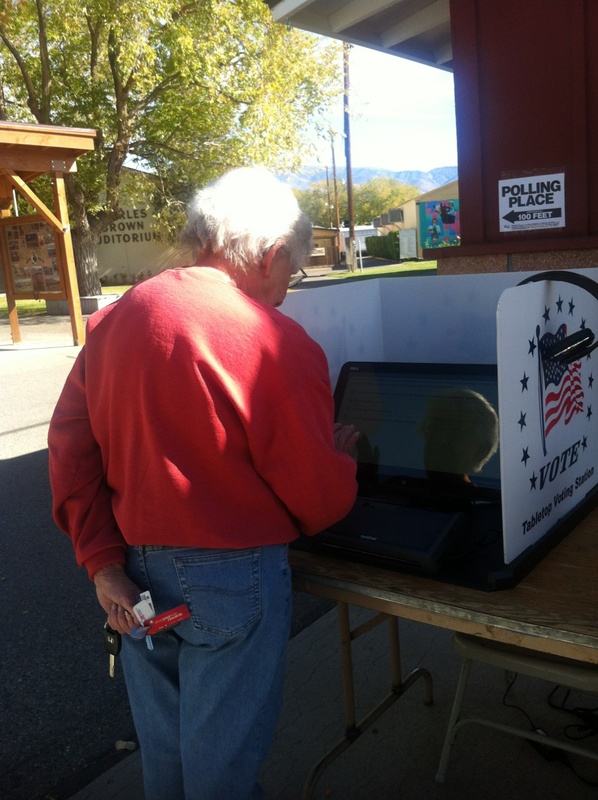 The voting system, known as LiveBallot Tablet, which is consistent with the Dechert Design, was tried by large numbers of enthusiastic residents in Bishop, CA. County Clerk-Registrar of Voters Kammi Foote told The Inyo Register that LBT is one of several next generation voting systems being developed to replace the current, outdated voting systems. Trying out the new system, voters marked their ballots for a community survey on a commercially available tablet computer, and then received a papery copy of the ballot they cast -- leaving no room for concern over whether the voter has voted as intended-- which was then placed in the ballot box. The voters who participated in the demo were also encouraged to make comments after voting. The system is more cost-effective, according to Foote, who also noted that the system has the added advantage of ensuring accuracy in voting as well as in counting votes. A map showing addresses that are assigned to the wrong precincts. November 19 is the worldwide celebration of GIS day (Geographic Information Systems). This is a day set aside annually to recognize how geospatial technology can better our lives. So how can GIS improve elections? In order for election officials to certify that every vote is counted accurately, they need to first ensure that every voter receives a ballot that includes all of the contests that they are entitled to vote for. While this may seem like an easy task, it is actually a very exacting and complicated process. In the United States of America, we elect representatives for many different offices in varying hierarchal divisions of government from U.S. Senate and Congressional offices to local School, Fire and Community Services Districts. These districts often have unrelated and overlapping boundaries which have been delineated and maintained through rudimentary legal descriptions and fragmented maps. The first step in determining what contests a voter is entitled to vote for is to divide each jurisdiction into the building blocks of elections – voting precincts. A voting precinct is the term used to describe a geographic area enclosed by an imaginary boundary drawn around it. Once the voting precincts are established, the election official must then determine which voters reside inside of these imaginary lines and which precincts the different offices on the ballot will represent. Historically, this has been a very intricate process based on street addresses. Prior to the advent of computers, election officials compiled lists of street addresses with related precinct and district information. Today, the street address information has been uploaded into computerized databases and the precincts and districts are automatically assigned to the voter based on these longstanding lists. This brings me to the exciting new developments offered through GIS. 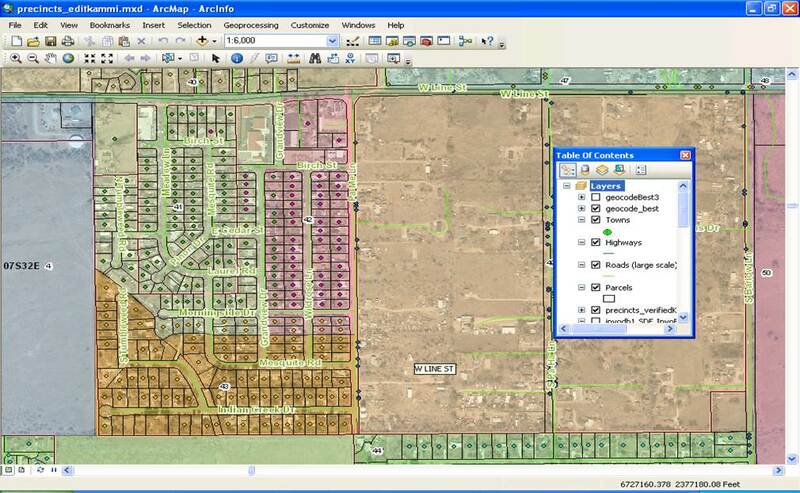 Using GIS, precise geographic locations can be created, stored, updated and analyzed. This means for the first time, election officials can overlay precinct boundaries, streets, parcels, voting districts, township/range lines, aerial photos, and voter locations in a unified interactive mapping system. All the relevant layers, including voter’s address information, can be interactively examined, corrected and verified so that citizens can be assured that they will be voting on the correct contests. Although this technology will allow elections officials to refine and audit the voter rolls, no system can be relied upon completely. The process of analyzing and verifying that a voter is registered in their correct precinct still requires meticulous data entry and careful oversight but with this new robust GIS toolset election officials will be able to have a more exacting and comprehensive database for all future elections. Did you know that 1/3 of all elections jurisdictions in the US have no web presence? Yet, voters are increasingly looking for voting information online. ELECTricty, a program of the New Organizing Institute, recognized this problem and launched a pilot project earlier this year to help elections officials maintain voting information online in an easy to read accessible website. As part of the program, the election websites of five jurisdictions that were selected for the pilot phase of the project, have been completely revamped. Because it is funded by a non-profit corporation and hosted by Google products, it is completely free. Election administrators in Inyo County (CA), Carroll County (OH), Mercer County (WV), Hardeman County (TN) and Takoma Park (MD) were coached during the month of July by ELECTricity representatives on issues including election data, plain language, and website fundamentals as part of the project which was launched in June. Before and after images of the election websites run by the participating counties can be found here. ELECTricity is a program of the New Organizing Institute. It is the result of collaboration with TurboVote, the Sunlight Foundation and the Center for Civic Design, with funding from the Democracy Fund. Two election system companies, SOE Software and Follow My Vote, joined CAVO as industry members in October. 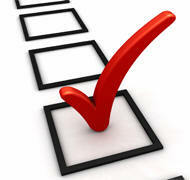 SOE Software is the leading provider of election management and online voting solutions. SOE provides required election administration solutions for the election process. Follow My Vote is a nonpartisan organization taking on the challenge of improving elections in democratic societies throughout the world by developing an online open source voting platform. 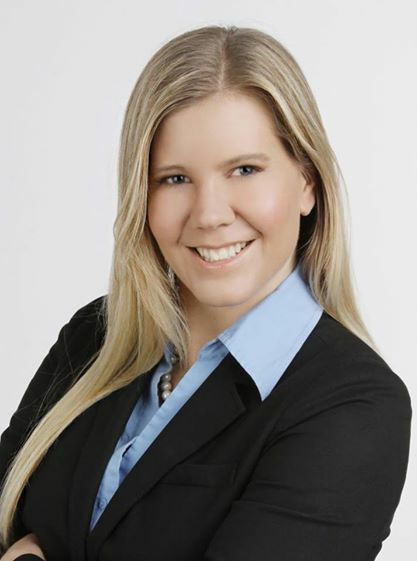 “We are excited to have SOE and Follow My Vote on board as members," stated CAVO President Kammi Foote. “We look forward to all industry participants engaging in best open source security practices." CAVO President Kammi Foote and Secretary Brent Turner will be speaking on a panel on Nov. 19 at the California Association of Counties annual conference at the CAOAC business meeting at 2:00 pm. For more information, please visit this link. National Federation of the Blind in October joined CAVO as a supportive organization. Other supportive members who have recently come on board are Brennan Center for Justice, Center for Women Policy Studies, Equal Justice Society and National Organization of Women. CAVO was represented by CAVO Secretary Brent Turner at a TechTable event on Oct. 27, with former U.S. Chief Technology Officer, Aneesh Chopra. With US voting machines aging, states have few funds to replace them and vendors are putting little new on the market.